Double X Science: From alchemist to chemist: What kind of chemistry is that? From alchemist to chemist: What kind of chemistry is that? What does the word chemistry mean to you? For many, it was a class in high school or college to get through. In these introductory courses, called general chemistry, one gets a mix of all the flavors of chemistry – but the flavors are very different. To those who hear the calling of chemistry, it isn’t just any chemistry that will do. Some courses are more interesting to them than others. Many instructors start their general chemistry course with a history, introducing alchemy. Alchemy is considered to be the process by which to turn [name item of your choice] into gold. Alchemists were chemists by accident in that they performed many chemical reactions in their quests, discovering a number of elements in the process - embodied by Hennig Brandt’s discovery of phosphorus from the refinement of urine. Alchemy relates to all the fields of chemistry. In perhaps the most famous of alchemy pictures, that by Joseph Wright of Derby entitled “The Alchemist Discovering Phosphorus,” the alchemist is kneeling by a very large round bottom flask. For many in modern chemistry, the round bottom flask signifies hours in the organic chemistry laboratory mixing chemicals together to create something new. Organic chemistry is the “branch of chemistry that deals with the structure, properties, and reactions of compounds that contain carbon” according to the American Chemical Association (ACS). Organic chemistry is the largest of chemistry fields in terms of number of people working in it. Organic chemists strive to make new compounds, usually to improve upon an existing one for a purpose and the field is often thought of in terms of synthesis applications. The actual process of converting urine to phosphorus generally falls along the lines of inorganic chemical reactions. The form of phosphorus in urine is in the chemical sodium phosphate (Na3PO43-). Heating phosphates along with the organic products also in urine will form carbon monoxide (CO) and elemental phosphorus (P). The sodium phosphate, carbon monoxide, and elemental phosphate are all inorganic chemicals, falling under the field of inorganic chemistry. Inorganic chemistry is “concerned with the properties and reactivity of all chemical elements,” according to UC-Davis chemwiki. While organic chemistry requires the presence of carbon in a specific type of bond, inorganic chemistry involves all the elements present in the periodic table. Inorganic chemistry delves into theories surrounding the bonding of metals to molecules and the shapes of molecules themselves. While the process of collecting phosphorus from urine requires organic and inorganic chemical reactions, the process of making the products in urine is biochemistry. 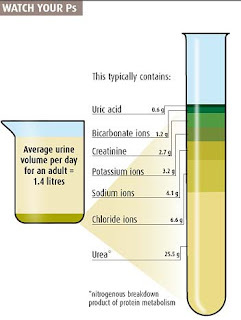 Note in figure 2 that the primary product in urine is urea. For students of biochemistry, images of the urea cycle (aka the Krebs cycle) are well known. According to the ACS, biochemistry is “the study of the structure, composition, and chemical reactions of substances in living systems.” Besides the chemical cycles to produce and use up necessary chemicals in biology, biochemistry encompasses protein structure and function (including enzymes), nucleic acids such as DNA, and biosynthesis. As the alchemist turned urine to phosphorus, he added heat. The addition of heat to a reaction involves thermodynamics, a subsection of physical chemistry. If heat hadn’t been added, the reaction products would have been kinetic, which is another subsection of physical chemistry. In a suite of physical chemistry courses, a student would also take quantum mechanics, rounding out the aim of physical chemists, which is to “develop a fundamental understanding at the molecular and atomic level of how materials behave and how chemical reactions occur,” according to the ACS. Physical chemists work by applying physics and math to the problems that chemists, biologists, and engineers study. The alchemists who took exact measurements of their reactants and products, using quantitative methods, employed analytical chemistry. Presumably, the alchemists did this because every ounce of gold was precious, and they wanted to know how much substance they started with to produce the coveted metal. Analytical chemistry focuses on obtaining and processing information about the composition and structure of matter. There are so-called wet lab ways to determine these quantities that often been employed. However, most analytical labs consist of the precision instrumentation that you may have seen on forensic crime shows, such as a mass spec, short for mass spectrometer, a frequent player on CSI. While the alchemists were only trying to produce a substance to enrich pockets, they ultimately led to a rich science with several subfields, each with a trail leading from the practice of alchemy. (1734-1797), Joseph Wright of Derby. "English: The Alchemist Discovering Phosphorus or the Alchemist in Search of the Philosophers Stone." Derby Museum and Art Gallery, Derby, U.K., 1771. Lawton, Graham. "Pee-Cycling." New Scientist, 20 December 2006 2006. Weeks, Mary Elvira. "The Discovery of the Elements. Xxi. Supplementary Note on the Discovery of Phosphorus." Journal of Chemical Education 10, no. 5 (1933/05/01 1933): 302. Wonderful post Adrienne! I seriously love chemistry, although I will admit I have never taken P-chem. All the chem majors in my college made it seem like p-chem was the devil, so I never took that leap! It is amazing how it all came to be, though (and the mention of round-bottom flasks now reminds me of Mr. White from Breaking Bad, not sure if that's a good thing!). Thank you, Jeanne! I am a card carrying physical chemist, but I understand the fear of the class. It is the most math-intensive of all the fields, requiring calculus and differential equations. The round bottom flask should remind you of Mr. White because he is synthesizing methamphetamine. The synthesis is a series of organic reactions. I know many chemists who really enjoy Breaking Bad, especially for the first season because of the chemistry shown. I'm a student of pharmaceutical-chemist biologist, so I Really love Chemistry. I think all sciences are conected by one thin line that is (sometimes) not evident. I really like your post Adrienne.